Send in the vampires because the sad day has arrived, my friends. We are out of garlic. Back in July, around the time he harvested many big, beautiful bulbs of garlic, Matthew also came across a guy selling his own locally grown garlic for a decent price at the farmers’ market. 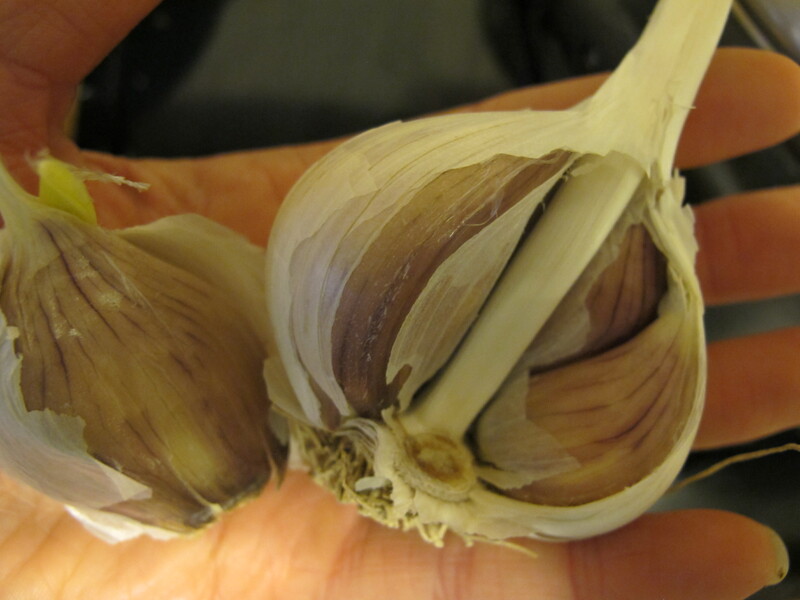 Knowing how much we love garlic — I start most dishes with the assumption of a nice-sized bulb — and knowing that he would be saving the best of our bulbs for planting this year’s crop, he bought thirty bulbs to supplement our harvest. Over the last several months, we made the most of that garlic — garlic in almost every dish, roasted garlic here and there, and a nice batch of bagna couda later, our stockpile dwindled. Unfortunately, the bought garlic was not nearly as high quality as what we grew — it did not store as well and had smaller cloves which are less fun (read: more work) in the kitchen. Whether it was garlic variety, growing conditions, and/or harvesting conditions, it just didn’t measure up. Still, I made the most of it, salvaging what I could toward the end and dealing with the small cloves. 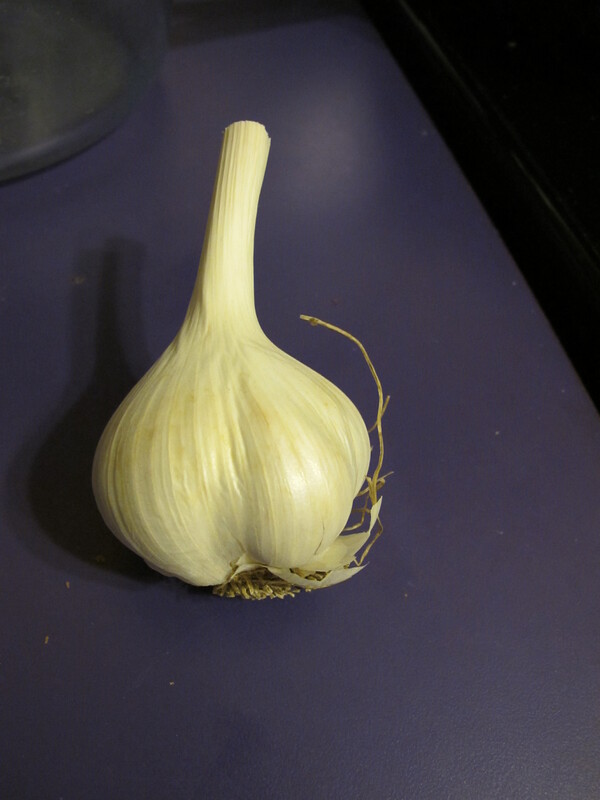 So, here we are in early March, with our last bulb of garlic (yes, our kitchen counter tops are, in fact, purple). A bulb in the hand . . . This guy started to sprout, but with four or five nice, still-firm cloves, I had no complaints. After stretching things out as long as possible with a jar of minced garlic we received as a gift, it was time. I used our last bulb of garlic in veggie fajitas on Thursday night. In my effort to not overcook the garlic, it ended up a bit on the raw side — not ideal, but what can you do? We currently have over 400 bulbs of garlic in the ground, waiting for harvest in June. Though we’ll be saving some for planting next year, we may have enough to get to this point next year without supplementing. Until then, I guess it’s back to the store for garlic. This entry was posted in Food, Garden and tagged grow your own. Bookmark the permalink. I was given a free bag full of garlic scapes last summer and used them in everything; i was sorry to see the end of them!